Thanks to Wikipedia, you trust crowdsourcing to inform you about everything from the continuing success of the Roman Empire, to the fact that "Max confesses to Kazaam that he and his father aren't really connecting, though Kazaam attempts to shirk the issue with some rapping." Wait that's wrong, Max and his father were totally connecting. So why not also trust crowdsourcing to design sweet sneakers, with The Mythical Shoe. The Mythical's the first-ever shoe from Hermosa-based Tweak, itself just launched by former Reebok/Nike/Adidas dudes intent on crafting kicks based on the desires of internet/social media jockeys whom the founders call "this generation's athletes", meaning you don't even want to see "this generation's gigantic nerds". 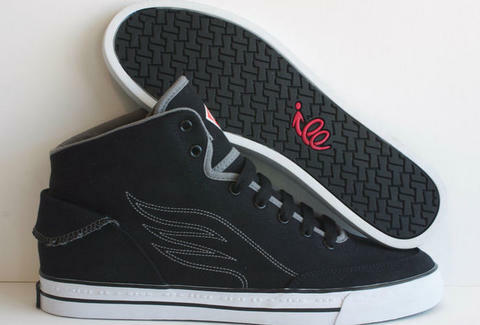 The look was informed by fans of video "Intertainers" Rhett and Link, who asked their thousands of 'net followers for suggestions; the crowd spoke, and the result's a tricked-out, black/or navy, hi-top canvas design replete with an embroidered wing along its side, just in case anyone forgot how fly you were. Other unusual, mob-demanded quirks include a heel flap that lifts up revealing a plastic pouch for slide-in graphic customization, a side pocket shaped to house a guitar pick, and a secret braille code (the owners refuse to share the message) running along the outer-sole, perfectly eye-level for those blind mice. Though the Mythical's it for now, Tweak plans on having at least five more crowdsourced pairs by the end of the year, which has 365 days, until someone out there decides it doesn't.